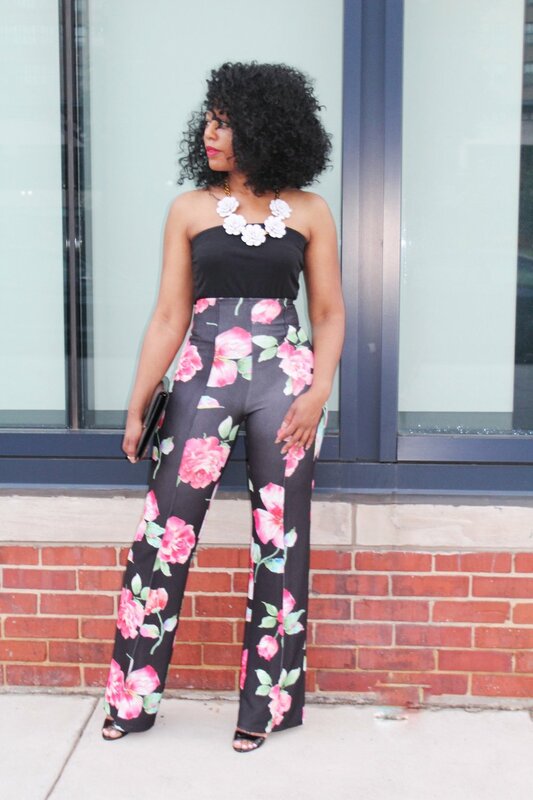 I had the pleasure of being sent these beautiful floral print pant from Polka Dot Posh Boutique, definitely go online and check out their items you won’t be disappointed. Let me just tell you how comfortable these pants are, I mean I could wear them all day long. They fit me like a glove in all the right places. I loved the high waist because they gave the illusion that I had long legs for days! Since they were high waist I preferred my top to be fitted, so I paired the pants with a black tube top. For my accessories I wore a white flower necklace I’ve had for awhile that went perfect to pull this look together. For a little edge I would also pair them with a cropped leather jacket. This was a dressed up version of a printed pant that could be worn at any event that calls for an elegant chic style. There are several different versions of the printed pants on the market, so you can choose whatever style that works best for you which can be a casual day look out with your close friends or doing some retail shopping. Let me know how you feel about printed pants?